Please help us spread the word about this important event by sharing the flyer shown here by sharing with friends, family members, co-workers, or anyone you think will benefit by attending. There are share buttons on the left side of the page to make it easy for your to share on your favorite social media sites. You can also help us by downloading the event flyer and posting it wherever allowable - such as stores, local businesses, libraries, faith organizations - anywhere you think it would bring attention to this important issue and event. You are cordially invited you to a FREE Workshop on Friday, May 1, 2015. The subject of this important workshop is This Isn’t What I Expected: More than Just the Baby Blues. 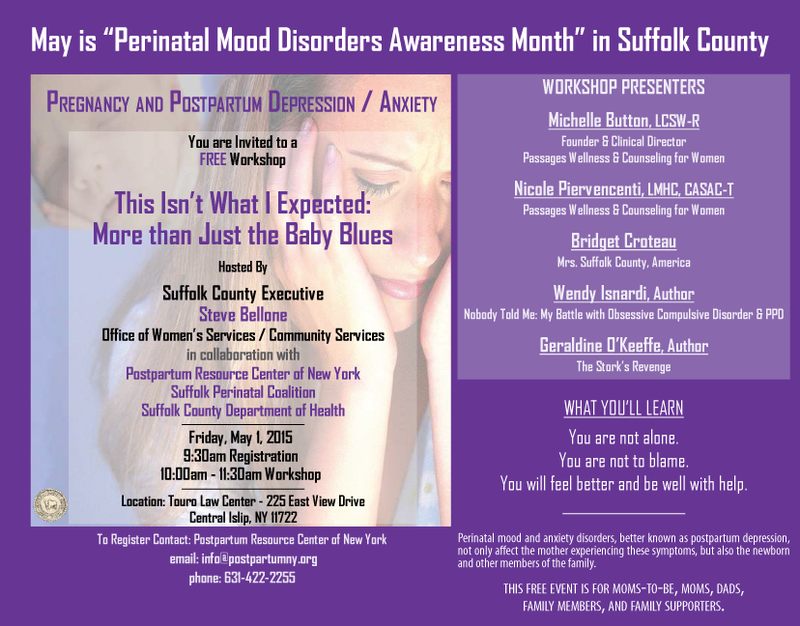 Hosted by Suffolk County Executive Steve Bellone, the Office of Women’s Services / Community Services, and in collaboration with Postpartum Resource Center of New York, Suffolk Perinatal Coalition, and Suffolk County Department of Health - this workshop is one of the kick-off events for “Perinatal Mood Disorders Awareness Month” in Suffolk County. This free event is for moms-to-be, moms, dads, family members and family supporters. You will feel better and be well with help.